ODK16 it the Dall-Kirkham telescope perfect for observatory installation, where it will offer exciting performance for every type of application, both photographic and visual. The particular design with integrated corrector provides at the same time a large flat field (52mm), a great focal ratio (f/6.8) and a large diameter (400mm). All of this to create images with high contrast, brightness and resolution! Each OrionOpticsUK telescope is built on order , delivery time is about 40 days after order confirmation. The Dall-Kirkham telescopes by OrionOpticsUK offer all the technical characteristics requested by amateur astronomers searching for the best telescope for long exposure astrophotography of deep-sky objects, but with a relatively long focal length. Thus it becomes possible to image the weakest and smallest details of distant galaxies, planetary nebulae and many other objects. Generally, when using a long focal length telescopes, recording faint objects is difficult since the focal ratio may become too long (for example, f/9 or f/10). Unlike other optical designs, Dall-Kirkham telescopes by OrionOpticsUK offer f/6.8 focal ratio, the perfect balance between brightness and magnification. These telescopes also offer a big correct field (even greater than 50mm) that lets you make the most from modern digital cameras with large sensor. In order to achieve these performance levels, inside the tube there's a corrector that flatten the field (without adding chromatic aberration). The optical system has been designed to offer a large back focus and thus enable the use of cameras with other accessories too (such as filter wheels or off-axis guiders). To the left, the optical design of the ODK16 telescope: it offers a long back focus (216mm from primary mirror cell) and big flat field (52mm). To the right, the spot diagram with on axis, 10mm, 20mm, 30mm, 40mm and 50mm. The white box represents a 10 microns side pixel. All the ODK telescope mirrors are made of glass Schott Borosilicate Low Expansion Suprax (virtually identical to Pyrex). OrionOpticsUK only produces high correction mirrors that are tested and certified using a Zygo laser interferometer, capable of measuring with high precision the produced optics. Moreover, unlike other telescopes, the ODK models offer outstanding performance even for visual use or for high magnifications planetary objects imaging. The Dall-Kirkhams design facilitates collimation that is easier to perform than other optical designs. The high quality mechanical construction, for both of the primary mirror cell of the secondary supports, ensure high stability of collimation that can be performed quickly and accurately. 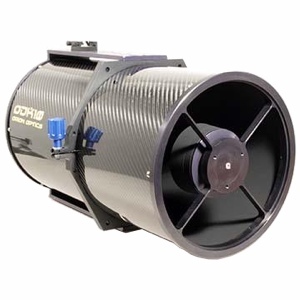 The tube is built of carbon fiber to reduce weight and to maintain a perfect rigidity. 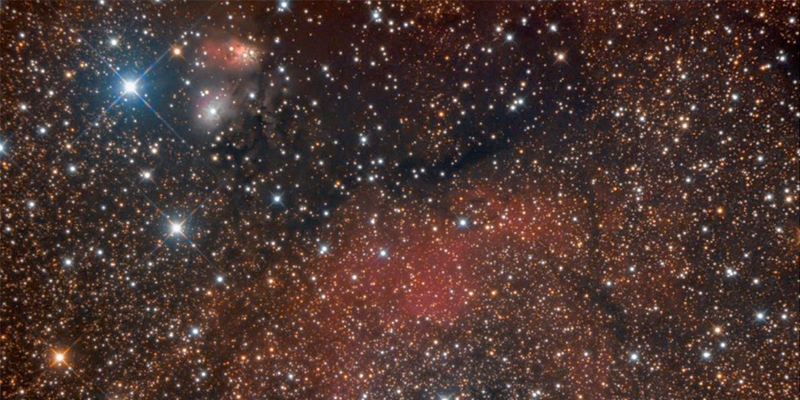 In addition, the carbon fiber has low thermal expansion coefficient to ensure ODK no change in focal point position in the long recording typical in deep-sky astrophotography. Furthermore, the open intubation ensures a short cool down time (also helped by the presence of 3 fan positioned in the primary mirror cell). The ODK telescopes use the giant ACU-3S focuser, a 3" Crayford model with 1:10 offering large clear aperture (76,2mm) in order no to introduce vignetting. With a very accurate precision movement, it also offers a high load capacity to allow the use of large and heavy photographic instruments. Left, view of ACU-3S with 50.8mm optional adaptor. Centre, view with 50.8mm adaptor removed. Right, view showing the back of ACU-3S with adaptor removed showing locking screw.